This Hotel is Currently Trending! Currently rated at 62% compared to its all time rating of 60% and ranking at 2 of 866 hotels (up 817 places from 819) based on reviews in the last 7 days. Nearest: Tube Station: King"s Cross Thameslink 0.2 miles (0.4 km), Railway Station: London Kings Cross 0.3 miles (0.5 km), DLR Station: Tower Gateway 2.2 miles (3.6 km), Motorway: M1 Junction 1 5.7 miles (9.2 km). 3 tube stations plus 3 railway stations within 0.5 miles (0.8 km). The Travelodge Kings Cross Royal Scot is actually located close to Kings Cross Station on the edge of Islington, Kings Cross and Farringdon borders. This is a good location for anyone wanting access to both central London and the City of London. There are actually 3 mainline stations with walking distance of the Travelodge at Kings Cross, St Pancras and at Farringdon. It's also a short Taxi ride (too far to walk) to Covent Garden and even closer to Bloomsbury. Nearest attractions include Saddlers Wells Theatre, St Paul's Cathedral, Dickens House and the British Museum. Nearest shopping centre is the Brunswick centre. Onsite the Travelodge Kings Cross Royal Scot offers a licensed bar and Bar Café Serves breakfast buffet, evening meals, and drinks. Wide ranging menu includes wraps, paninis, steak, fish, salad and pizzas. There are luggage storage lockers available for a fee (cannot be reserved). Located in a busy commuter area with nightclubs close by so some noise may be heard. ID may be required on arrival. Unusually for a Travelodge the hotel has meeting facilities. Smoking is strictly prohibited throughout. The hotel is not a purpose build as are the majority of Travelodge hotels which means the bedrooms will differ from the normal standard type bedroom at most lodges. Travelodge provide standard facilities across their UK chain in order that the customer knows what to expect at each Travelodge. Standard facilities include King-sized bed and duvet (in most Travelodge's), En-suite bathroom, Remote-control colour TV, Tea and coffee-making facilities, Direct dial phone, Internet access and In room films. Onsite standard facilities include a 24 hour reception, breakfast served (charge) and a drink/snack vending machine. Travelodge Farringdon: is 311 yards (284 metres) away, has a guest satisfaction score of 80% and rates start from about £61. Travelodge Kings Cross: is 403 yards (368 metres) from here, earns a customer rating of 70% and base rates begin at about £59. Travelodge Euston: 0.7 miles (1.1 km), rated at 80% and with rates from around £71. Compared to other London hotels: This hotel has been rated 60% by past guests (however its currently trending higher, see note at the top of the page for its 7 day ranking). The London average is 80% and the average for 3 star hotels is 76%. Therefore this hotel is below average for its sector (star rating) . Travelodge Hotels across the chain average 74% so this hotel is below the average guest rating for Travelodge hotels. Milesfaster ranking: 819th from 866 London hotels, 40th of 43 Travelodge Hotels, and 301st of 329 three star rated hotels. For a hotel that offers lower base rates take a look at the Holiday Villa Hotel. 4.6 miles from the Travelodge Kings Cross Royal Scot (7.3 km), has been rated at 70% by past guests and the hotels starting rates begin at about £47. Can we suggest something with a higher guest score? We suggest the 4 Star Amba Charing Cross seems like a possible option being 2.0 miles (3.3 km) from the Travelodge Kings Cross Royal Scot. The Amba Charing Cross has an extremely high guest rating of 98%, one of the best rated London hotels. 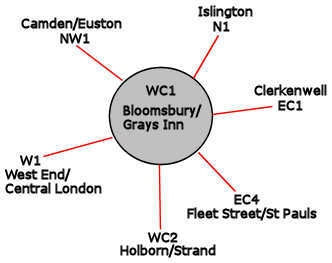 The fifty closest hotels from here (100 Kings Cross Road, WC1 postcode) that we have data for cover a 0.8 miles (1.3 km) radius. The 50 are made up of 4 five star hotels (average rating 87%), 18 four star hotels (average rating 83%), 18 three star hotels (average rating 77%), 8 two star hotels (average rating 71%) and 2 one star hotels (average rating 62%). Top 3 star hotels are Premier Inn St Pancras and the Premier Inn Holborn (both 90%). Coming out as the top rated hotel is Montague On The Gardens Hotel (4 star) at 99%. Base Rates: Using base rates we analyse average starting rates for the area. Useful as a guide but note they do not include special offers or short term deals. The average rate for all the 50 nearest hotels is £100 per night. Starting from £16 at Generator Hotel (2 Star, 77%) up to £222 at Renaissance St Pancras (5 Star, 89%). Averages by star rating: Five Star average: £172, Four Star average: £123, Three Star average: £87, Two Star average: £56 and One Star average: £53. We use a proprietary algorithm to rank hotels based on user reviews but adjusting for contributing factors. We rank Travelodge Kings Cross Royal Scot 46th (joint) of 50 nearby hotels and 16th (joint) for the 18 three star hotels in the area. In terms of lowest starting rates this hotel is 28th of 50 (12th of 18 three star hotels.). Analysing both the base rates and overall rating for the hotel we rank it 40th of 42 for sheer value for money (Generator Hotel was top). Directions: A few minutes walk from Kings Cross station. Exit King's Cross station and head up Pentonville Road. Turn right into King's Cross road (A201) and Travelodge Islington is on the left hand side. Parking: Onsite 40 spaces all chargeable. Nearby NCP public pay car park at Bowling Green Lane. History: In June 2016 Hong Kong-listed Magnificent Real Estate agreed to buy the hotel for £70.3 million pounds.